The ascending, or “jazz”, melodic minor scale is one of the most central and recognizable sounds in jazz. Late 19th and early 20th century composes like Debussy and Stravinsky used this sound in their music, and jazz musicians soon afterward began to adopt this tonal color. Melodic minor has become an essential part of any developing jazz musician’s vocabulary, and mastery of this scale is considered to be mandatory. Because the melodic minor scale is so prevalent and has been in widespread use for so long, there are a multitude of instructional materials available covering the use of this scale in jazz. Many jazz musicians, however, don’t have a thorough or complete understanding of the theory behind the use of the scale, and still more don’t have as extensive a mastery of the structure as they could. This two-part class presents the melodic minor scale in a thorough, complete way, with the goal of giving a total understanding of how it has been, and continues to be, used by master jazz musicians. Part one of the class breaks down the theory, revealing how, why, when, and where to use the scale and providing a clear explanation of the modes and many different techniques to make learning and utilizing them easier. Part one could be used by any jazz musician interested in gaining a more expansive knowledge of the melodic minor scale. Guitar fingerings and tablature are given, but traditional musical notation is also used throughout so that any instrumentalist or vocalist can benefit. 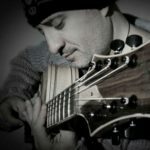 Part two of the class, which is more guitar-centric, presents a methodical and comprehensive way to gain mastery over the melodic minor scale, with numerous examples and exercises for increasing fluency. Part two also presents some imaginative and exciting ideas for generating new musical sounds with the scale, both for comping/chordal playing and single-note soloing. • All musical examples from the video are provided in music notation, tablature, and chord grid form. • Each example performance in the video is titled and numbered for easy navigation. Get both Parts 1 & 2. Tom has incredible teaching and tackles subjects very clearly on the complex subjects, I recommend any of the classes. Congratulations Tom and team site! Tom is a great guitarist and an amazing teacher. I highly recommand you his lessons, U ll learn the melodic minor scale in depth and learn surprising use of it. thank u tom! I recently purchased several of Tom’s classes, including this one. He is an excellent teacher and I am very impressed by the thoroughness of the instruction and the handouts. You will not go through his classes quickly: the information he provides will be part of your practice routine for as long as you continue to play. I recommend his classes very highly. Great lesson packed full of ideas, concepts and examples to work through. This masterclass will be keeping me busy for some time. Tom is a genius!! An awesome teacher and player!!! He explains the material clearly and thoroughly. I have previously bought masterclasses from his Jazz Harmony series and can say there is definitely something for everyone in his lessons. You are going to be busy with this one, folks, oh yes you are. Not really a surprise coming from Tom. Another outstanding course from Tom Lippincott. Thorough, clearly explained, useful knowledge. All the courses I have purchased from Tom have been excellent! Mike’s is a page I have bookmarked. I happened to be surfing when these 2 came available, and I did not hesitate to make my purchase instantly. I have NEVER been disappointed with any of Tom’s classes, and these 2 are no exception. clear, concise, thorough, voluminous, all you can ask for. these are totally modern and forward-thinking classes, classes for the year 2099, so Eddie Condon wannabees, sorry, hafta go elsewhere. Great course!! Tom’s classes are always top notch!!!. I have ordered quiet a few of them and have never been disappointed. I highly suggest any of his courses!